By John B. Lennes, Jr. This post was received shortly after Nancy's death in 2014. We add it here now to celebrate and deepen her memory on the 4th anniversary of her death, in a time of Republican rule she would hardly recognize. Nancy Brataas was a person of grace, dignity, intelligence, and humor. ​This is a rare, often undetectable combination of qualities in Minnesota public life in any era, and the 1970’s, ‘80’s and ‘90’s were certainly no exception. In many ways her philosophy defied conventional categorization. As soon as people thought they had her pigeonholed, they were often proven wrong. While disquieting to shallower theoreticians, this was merely evidence of a thoughtful, many-faceted, caring and intelligent human being who made up her own mind, and sought out information and wisdom wherever they could be found. I think it may have been another Minnesotan, Harry Reasoner, who once said (in effect) that he mistrusted party labels and political shorthands, because they all too often bunched him with people with whom he may only have shared one thought in an entire lifetime. He would have recognized a kindred spirit in Nancy Brataas. I worked for and with Senator Brataas in a number of capacities: as legal counsel to the Minnesota Senate, as General Counsel to the state Chamber of Commerce, and as Commissioner of a major state agency, among other assignments. We worked on many of the same issues, and I was both in support and in alliance, as events dictated. These were often highly complex and contentious matters, played out not in weeks or months, but in years and decades, at the highest levels of intensity and public attention; you learn a great deal about people when you serve alongside them in such times and circumstances. Senator Brataas was not an easy person to work for. All too often in public debate, it is “enough” to prevail over your opponent, even if your opponent does a poor advocacy job. This is particularly the case when you know “you have the votes” no matter what. Senator Brataas rarely had that luxury ab initio, although she won her battles more often than could reasonably have been expected. Rather, her successes were attributable to working harder, and being far better prepared than the opposition. She demanded the highest level of performance from herself and from those around her as well. I learned that lesson early when, after having prepared a briefing paper for her, I was told, simply, “this is not good enough; you can do better.” So I did, and I have tried to maintain that standard ever since. She may not have been an easy person to work for, but there could never have been a better crucible for forging professionalism. Not easy, but instead, the best. She treated everyone with courtesy, not always a natural thing in the heat of public debate. She acknowledged points well taken, even when adverse to her own objectives. I never saw her descend into the pit of personal antagonism when contesting often emotional matters. She was a genuine and reliable resource for her fellow legislators, even those who opposed her on issues, spending time to explain technicalities and occasionally recommending positions that fit the needs of her colleagues, even if contrary to her own (“If I were you, this is what I would do…”). I am not sure that this sort of thing happens much anymore. It was a trait she shared with several other recently departed Senators, such as my friends Win Borden and Jerry Anderson, and with Rep Wayne Simoneau, among others (Simoneau used to have a slogan framed on his wall reading “Wayne’s first law of politics: Not all the jackasses are on the other side”). I was not privileged to have known all the various facets of Nancy Brataas. But I knew her well enough to know that she was a great person, and that we are unlikely to see her equal again. Excerpted from a letter from Tom Fowler, a Rochester friend of Anne’s who worked for Nancy on the Nixon Campaign in 1972. Tom wrote this shortly after Nancy’s death in April 2014. We post it now in tribute as her death-day anniversary approaches. ….Nancy was a remarkable and gracious woman, and the greatest organizational genius I've ever known. different for me in that relationship as a staff member, than for you and Mark as children. She was tough but fair, supportive but never micro-managed her staff, smart as a whip, and suffered neither fools nor gamesmanship. She was the best boss I ever had. For me she was the embodiment of the word "integrity". What was her role in Nixon's 1972 re-election campaign? in the10 electorally key states, comprising 250 telephone centers, and 40,000 volunteers, who completed 14 million calls by Nov 7.
to organize a voter ID and get-out-the-vote campaign like it. jobs, and not much time for polical volunteer work. The IBM mainframe computers we used are now museum pieces; today's political voter ID programs are based on the Internet, mobile devices, and social networking. modern terms, she was a "political entrepreneur". Nancy was the organization genius behind it all. She had a crystal clear idea of how every one of those 40,000 volunteers was supposed to fit in. time for the criminal foolishness other parts of the campaign cooked up. pleasant conversation. She was a model for poise, always. consulting. And it turned out that way. She was a lot more motivated by service to others than in making a dollar…. A friend asked me the other day how long I had known Nancy Brataas. My answer was 32 years. Thirty-two years as a full-time or part-time employee, a volunteer and a friend. I have lots of good memories of those 32 years. There was never a dull moment at Nancy’s house. I went the first day with a good Norwegian work ethic and it served us well We all worked hard and Nancy was right there working with us, unless she had a meeting. After I started working at the Mayo Clinic, I would leave early a day in the week and see what projects Nancy had for me. Often she would bring or pick up projects at the horseshoe of the Mayo Clinic Ozmun parking lot. It was always good to see her at Homestead enjoying most of her belongings from her beloved SW Rochester home. She loved the view and told me she felt like she was very close to the country. I want to share a few highlights of Nancy’s Last Road Trip. Last September, my husband and I had the privilege of seeing that Nancy got to a West Bank Board of Directors meeting. As always Nancy was in charge. We had just found out our dog had hip dysplasia, and was not doing very well at the time. Early on the day we were to leave we took Sadie to my sister and brother-in-laws in Wabasha. We arrived at Homestead about 9 am, planning to leave about 9:15. I believe it was 11:15 when we headed south. The car was full of bags and oxygen machines. My husband, Jerry, and Nancy were in the front seat and there was room for a large oxygen tank and me in the backseat. We stopped at a Subway for Nancy’s favorite chicken sandwich with 12 slices of tomatoes and double cheese. Nancy had forgotten her curling iron at home and we stopped at Walgreen for a replacement. It was after 4pm when we received our destination. We got checked in, and worked to get Nancy settled. The hotel staff found about 12 extra pillows and Nancy told us how to fix the bed so it would be comfortable for her to sleep. Nancy rested a little and got ready for her evening banquet. I got her to the restaurant for the meal and a waiter said he would take her back after the events of the evening. She had our number so we could be called at any time. She was ready for the meeting, the next morning, in plenty of time and we got her to a good table for the Board of Directors meeting. Lunch, after the meeting, was a buffet. We checked the food over four times finding many items that she liked. Got Nancy situated with her group, and Jerry and I ate in the dining room. I went back to check on her three times and she was enjoying the company and the meal. Check-out time was at 11, and Nancy’s meeting wasn’t over until nearly noon. Think it was between 2 and 3 when we got packed up and headed north. We tried to make check out easy for Nancy, but it was hard work for her to get ready for the trip home. We had our GPS and a Map Quest plan, and an atlas. Nancy enjoyed the atlas. Our visit included observations along the way. Places that Nancy had looked for plants and other treasures. She told us she’d had lessons on what different pieces of farm equipment were when she was running for Congress. We made a necessary pit stop for gas and a bathroom break on the way home. Our shopping included Cheetos and Quick Star Glazers. Our home is just two miles west of Highway 63 about 7 miles after entering Minnesota. We showed Nancy our home and our nice neighborhood. She was impressed with our big yard. If Jerry would pick me up at her house, she would often give him a tour of her yard. So we were glad to show her our farm. About 35 miles later, we were back at Homestead. We got her things carried in and helped her get settled. Then we headed to Wabasha to visit with my sister and pick up Sadie, and head home to Ostrander the next morning. I think Nancy may have eaten Cheetos and Glazers for supper/dinner that evening. Nancy was so appreciative of us making the trip with her. We will always remember Nancy’s last Road Trip. This ornamental garden pot was one of Nancy's garden treasures. It is now planted by Jane with feisty, brawling blooms of begonias worthy of Nancy's impactful spirit! She has earned the right to rest in peace. Nancy and her dear friend, Rochester television personality journalist and poet laureate of Rochester, 2014, Jane Belau. 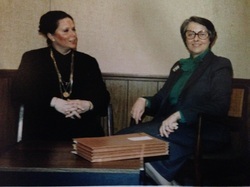 The two were conducting a 1980s interview on civic betterment and Nancy's work in the State Senate. My aloha is with you all as you carry on the legacy of strength, independence, and leadership that you received as descendants of Nancy. May you find comfort in each other and good memories together. Nancy, my godmother, always seemed to defy so many of life's strongholds.... Many blessings. Please accept my condolences on the loss of your remarkable mother. I know how much my own mother admired her energy and friendship and how my father liked talking all things gardening with her. I smiled as I read about your mother's stash of wonderful toys for her grandkids and remember with fondness the play kitchen you had in your house where we played as kids. She certainly rocked Rochester and inspired others--especially women--with her full-steam-ahead, can-do attitude. My thoughts are with you and your family as you remember and honor her dynamic life and career. Memorials may be made to Mayo Clinic, University of Minnesota Rochester; Clearway Minnesota—or any cause of your choosing that needs help. Nancy was here to help; she believed we all are. The Story Laboratory, LLC. (c) 2016. All Rights Reserved.